The most efficient way to edit multiple classes at once is to use Edit All Classes from the Classes menu. Easily change out the instructor on several classes when a new instructor is assigned to them by filtering for only Classes with Instructor (current instructor) and then using the Global Change (yellow) area to select the new instructor. Quickly and efficiently block online web registration for multiple classes by filtering for only Classes with Allow Web Registration (Yes) and then using the Global Change (yellow) area to change them all to = No. If you have a large number of classes in your database, this function can be very "heavy" to load. For best performance, filter down to smaller groupings of classes using the search criteria. If there are enough classes that multiple pages are available (more than 50), click the Show All button to place all results on one page. To edit some (but not all) classes in the list, use the drop-down fields in each class row, make changes as needed, and Save Changes. 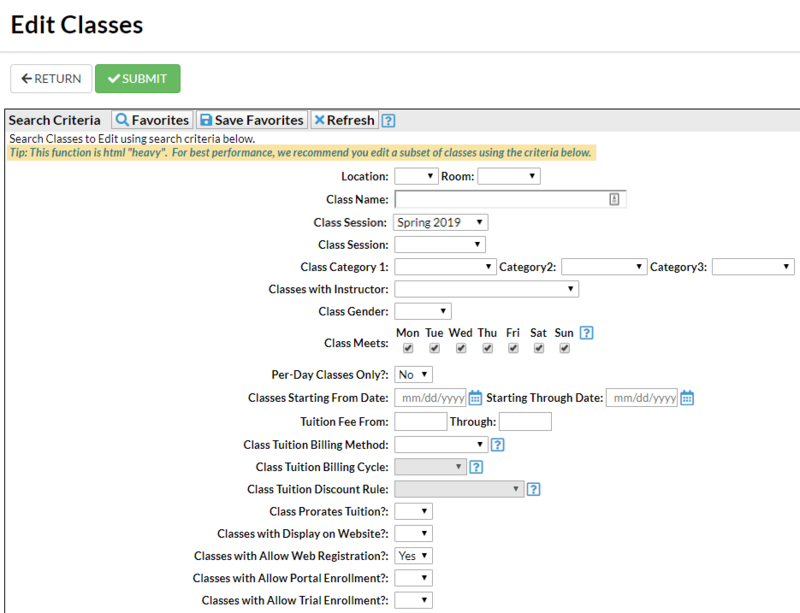 To globally edit all the classes selected at once, use the Global Change area (yellow row). Be sure to select Show All (if there are more than 50 classes that meet your search criteria) prior to making global changes. When you use the Global Change area, you will get a pop up asking if you want to set each value to the global value. Choose OK. This will then populate the global values into every class below. Save Changes to apply all the global updates. Edit all classes even allows for editing of archived classes. Set the Class Status criteria to either blank (to include all) or Archived.